It is 11:28pm here in Key West, Eastern Standard Time. I am at home with my fiance, two dogs (one we are just dogsitting but considering purchasing), three cats, pet skunk, hamster and betta fish. There are many things I wanted to accomplish before the end of the year: have my house clean, finish the calendars I make every year for my friends back home, register for school, get my Florida driver's license. I'm hoping to get all those things done in the next two weeks, the less I have to stress out about on top of wedding plans. We are thinking about buying the chihuahua. It was hard to take him back to the pet store last week, and when I took Buster in to be groomed on Friday, the chihuahua went crazy when he saw him. When I brought him home tonight, he was just as excited to see Buster and leapt up and kissed him. Buster has been so good with the puppy, making sure not to step on him, letting him bite his ears, climb on his back, and generally harass him. It's a tough decision. We're falling quickly for him and he's obviously bonded to us. Scott made the point the other day that we want a human baby and we keep bringing animal babies into the house. I think to an extent that all these animal babies with different schedules and dietary needs are good training for parenthood, not that I think parenting is or will be easy, I know better than that. Anyone who thinks they are fully "ready" for children is nuts. Hopefully this year will bring us a chance to move to a more cost-effective home, more time with friends and family, and the chance to make some happy memories. Christmas came and went far too quickly. I suspect it has something to do with the fact that I worked on the 24th and the 26th, in addition to feeding and watering everything at the store on Christmas Day. As a result of forgetting to water our tree a few days in a row, it has dried up pretty quickly and is shedding needles at a great rate. That, combined with one of the cats insisting that the tree-skirt is a good place to pee, has convinced me not to leave the tree up for all 12 days of Christmas as is usually my tradition. Christmas Eve dinner was pierogies and apples with carmel and peanut butter for dipping (the apples, not the pierogies). After dinner we opened one present together, a coffee table book called SNOG: A Puppy's Guide to Love from my cousin Carrie. We read through it together and then Scott ushered me off to bed so Santa could come down our non-existent chimney. Christmas morning we awoke fairly early to the sound of the Chihuahua barking in his kennel. We took a family walk with Buster and Cocoa Puff, (or McLovin, depending on the day) and the puppy pottied outside for the first time ever. I was very proud. We brewed a batch of coffee and opened our gifts, beginning with the stockings for the animals. My stocking was filled with all kinds of goodies, the most popular being the yogurt covered pretzels that were gone by the end of the day. Since I was on duty to take care of the animals at the store, I headed over around 10am and Ricky met me there. We managed to feed and water everything in about a half hour and then headed back to the house. I had invited Ricky, Debbie and Toni for brunch, which was a huge amount of scrambled eggs, sauteed veggies, and toaster waffles. After brunch we watched "A Christmas Story" and then I took about a two and a half hour nap. Once I woke up we gathered the chihuahua and drove up to Cudjoe Key to my bosses' house, where we enjoyed their various animals and spent a couple of hours competing on an X-Box Karaoke game. We made it home at about 2am and I went to bed. We miss the chihuahua. We're considering buying him. We're nuts. 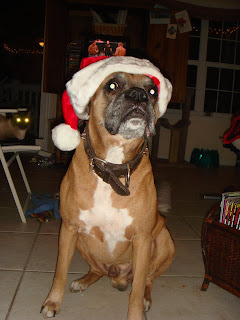 'Twas the night before Christmas, and all through the house all the creatures were stirring and hoping for snacks. Since there are three puppies not yet sold and the store is closed Christmas day, each of the three remaining went home with someone for two nights. I got to bring home the afore-mentioned Chocolate Chihuahua. He has settled in just fine, decided his bed is a folded wool blanket beneath the coffee table, and already made the skunk jealous. Stinkerbell has spent the majority of the evening pouting in her bed (in her cage by choice) and had to be bribed out once the puppy went to sleep. The cats are pretty accustomed to new animals being brought into their lives now, Buster was the first major interruption in their cat-centric lives, followed by a Betta (a relatively mild distraction), Hamster and then of course, the skunk. When they saw the Chihuahua they just sniffed him and then retreated to a position with a good vantage point. Buster immediately understood that it is a dog, very small, and fragile. He sniffed it and then wanted to play. He has been very careful not to step on the Chihuahua and was happy to share his toys and bed. Since it is Christmas Eve, I decided they should all be festive. I know better than to try and put anything on Minx, as I'd like to keep my face intact, but I put a lovely velvet bell collar on Maui and then on Chou. Maui was fairly tolerant, but very happy when Scott rescued him. Chou is reasonably used to being subjected to embarrassing fashion attempts. He sits calmly and only shows his displeasure by glaring at me. Buster is very happy to wear his Christmas sweater, much to Scott's chagrin. Scott only allows the wearing of the sweater because Buster is visibly proud to have it on. When I bring it out of the cupboard he immediately comes over and sits at my feet, ready to be festooned. Being in Key West, we are running our AC even on Christmas Eve and the Chihuahua got a little chill. I transformed an old sock into a sweater with a matching toque. This is a silver Chinchilla. He is one of two we have left at the store. "The international trade in chinchilla fur goes back to the 16th century. The fur from chinchillas is popular in the fur trade due to its extremely soft feel, because they have about 60 hair sprouting from each hair follicle. The color is usually very even which makes it ideal for small garments or lining of large garments, though some large garments can be made entirely from the fur. The pelt of a chinchilla is relatively small, so many animals must be killed to make a single coat. This fact led to the extinction of one species, and put serious pressure on the other two." Fortunately we bring them into our store as pets, and we have the fun of getting to play with them ourselves. They are very curious, and like to nibble gently on things as they explore. This can include the tip of your finger if you are holding one, but it doesn't hurt. 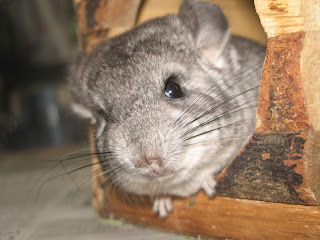 Chinchillas are very clean, not requiring a water bath. A Bath House is placed in their living area and holds a small amount of Bath Dust. The Chinchillas get in the bath house and roll around until they feel they are appropriately clean. I have to say, it's pretty darn cute. Christmas is a time for Reminiscing. That's me in the middle. I miss this. Why would someone steal in the first place. Especially when they are GIVEN things to begin with? I do not understand this. Perhaps the guilty party is a kleptomaniac. Whatever the reason, it puts a dent in my Christmas Spirit. I wish that people that feel the need to steal would just admit it and avoid the situation that they steal from entirely. Grr. 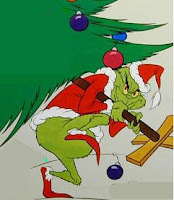 And a tiny bit of Bah Humbug. 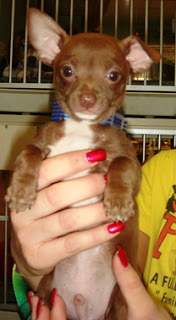 I don't usually go in for the small yappy dogs, but this chocolate chihuahua just cracks me up. He's in our "puppy window" with a jack russell, a papillon and a rat terrier. He is easily the smallest. The other day I saw the jack with a chihuahua front leg in her mouth, the rat terrier had a back leg, and they were dragging him across the floor of the window. He got up and ran right back for more. Couldn't you just eat him? With whipped cream maybe? It's still happening. I made dinner for 3 and then baked a batch of mini-blueberry muffins. ...Let your heart be light! Lights are still $2.50 for a box of 100 at the craft store, so I picked up two more in hopes that they will be enough to light the bottom 1/4 of my tree. I wasn't off today, but I worked from 9am to 4:15pm and then came home and took a little nap on the couch and ottoman with Stinkerbell while Scott made dinner (YUMMY). Then the spirit of Martha Stewart possessed me again and I went to three different stores, picking up pictures and supplies. Once back at the house I put Mixed Nuts into the DVD player (it's one of my three* Christmas movies that I must see every year) and started cooking. I made a gigantic batch of peanut butter cookies and a pan of "double-layer confetti brownies" with m&m's in them, wrapped some more presents, and did another load of dishes. I don't know what's gotten in to me. *The other two are White Christmas and Love Actually. Today was my day. I was off of work today and decided to make full use of it. I planned to get up in time to have a shower and look presentable on meeting my bestie Steph for breakfast at IHOP. Scott set my alarm for 10 PM and I woke up much too well-rested at 10:59 with one minute to get to IHOP. I phoned Steph and made sure she was going to be late, then took the dog for a quick jog around the condos. I stuck a headband in my bed-hair (not the good kind of bed-hair, either) and jumped in my car to race to the restaurant. Our house is on large concrete stilts, as we live in hurricane country. This is great if there's flooding, but not so great if you are backing out of the carport between the stilts and not very awake. I shaved off my driver's side mirror. Didn't even leave it hanging. It lay pitifully in the driveway waiting for me to rescue it. After much swearing I collected the poor thing and headed off to pancake-land. The night before last Steph helped me haul a Fraser Fir through the bushes between Home Depot and our house. 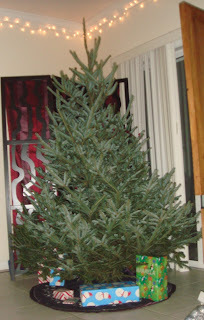 Last night I bought some lights at K-Mart (the only lights that were left) and put them on the tree. I bought 8 strands of 35 lights each. They don't plug into each other and they only covered about the top third of the tree. This morning after breakfast I went to the local craft store and discovered that they still have lights (lots and lots and lots) AND they are on sale! I got boxes of 100 light strands for $2.50 each! I then went to Ross and bought an ottoman. Not a Christmas thing, I know, but it's a very lovely ottoman. The cats especially are enjoying it. Once I got home I lugged the ottoman out of my trunk and all the way up the outside stairs. I hit "shuffle" on my i-pod Christmas playlist then cleaned the kitchen and living room, did a load of dishes, three loads of laundry, put the couch-cover back on the couch, wrapped some presents, washed the tree skirt (a cat had peed on it), clipped some cat claws, set the table with a lovely silver table cloth and 4 place settings, took the dog for another walk, downloaded pictures from my camera and then uploaded them to Walgreens to pick up later, put two strands of lights on the tree (STILL not enough) and three strands on the exterior of the house. And THEN, I made macaroni and cheese. Working retail during the holidays is crazy. I did it ten years ago at the GAP in downtown Portland, and our pet store on our tiny island is nearly as busy as the holidays approach! Today we are getting baby ferrets and chinchillas (for those who've never met a chinchilla, I'll be posting pics soon. They're AWESOME.) and next week another round of puppies. I've put together some gift baskets that will give customers the opportunity to save 20% on everything in the basket if they buy it as a whole, and we've decorated the store with lights, tinsel and so far, two trees. I am sending out the first of my wave of Christmas cards today, and hoping we will procure a tree from somewhere soon. Scott's not interested in the fake ones, however practical they may be, so we'll see if we're going to get an actual fir tree or go with our potted palm like last year. Thanksgiving morning sledding. This is a family tradition on my mom's side, at least for the last 5 years, maybe before that. All the boys (and me) trek up the Blue Mountains and spend the day carving a fantastic run. It was so much fun to be in the snow. Everyone was concerned for my poor tropical thermostat, but I fared just fine until my toes got cold. Fortunately Don loaned me his snowboarding boots and they warmed up for a good hour or so. Ultimately we had to pack up the toboggans, sleds, and innertubes and make our way back down the mountain. But first we had some fun behind the truck.